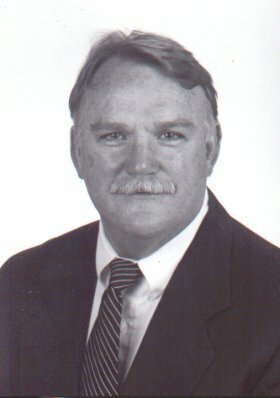 "Wrestling at Lee High School ended in 2010 after 39 years of existence. It was begun by coach, Bill Bofinger in 1969. The successful program can be attributed to the dedication and perseverance of Coach Bofinger as well as the many parents who have helped keep this program going. 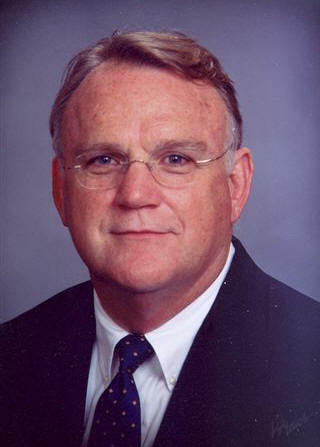 Wrestling is supported by the administrators at Lee High School, who have steadfastly stood by us. The wrestling program is self-generated and receives no money from the school or school system. 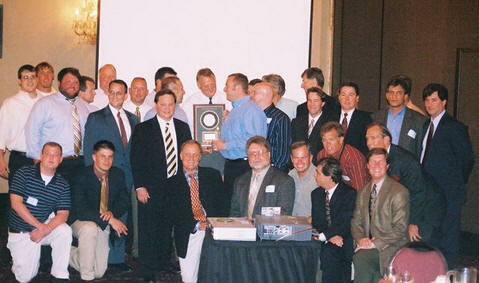 This highly successful program has produced many champions. Lee High has been the Baton Rouge City Champs ten times. 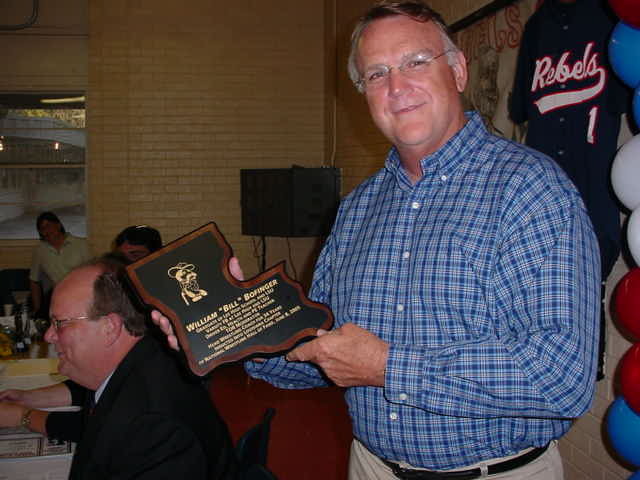 In 1971, Lee High took 7 out of 12 weight classes in the Baton Rouge City Tournament. Lee High wrestling has produced 77 individual city champs and 6 Outstanding Wrestlers. We have 17 two time City Champions and 3 three time champions. We have finished first in the regional tournaments three times with 4 second and 4 third place finishes. In 1979, five out of twelve weight classes were won by Lee Wrestlers in the regional tournament. In 1996, 6 out of 14 weight classes were won by Lee wrestlers. Lee High School still holds the team scoring record in the regional tournament. Four Lee High wrestlers were 2 time regional champs and one was a three time champ. For 25 of their 39 year history the Rebels have finished in the top 20 of all high schools in the state. For 5 of those 29 years, the Rebels have finished in the top 5 of the state. For 16 of those years the Rebels have finished in the top 10 schools in the state. The Rebels have produced 19 state champions and 21 second place finishers." 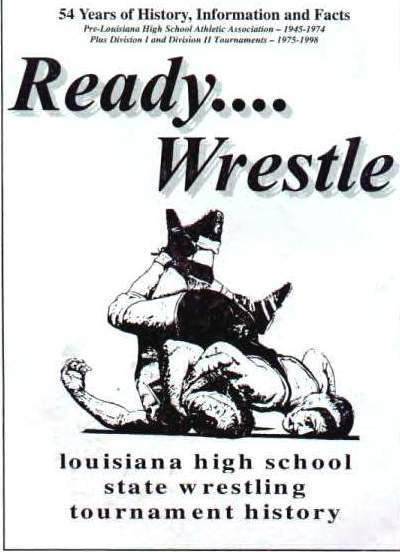 Since 1991 after the death of and collaboration with Ken Cole Coach Bofinger has researched and documented the history of the state wrestling tournament in Louisiana in his book, "Ready....Wrestle," which he updates every year. 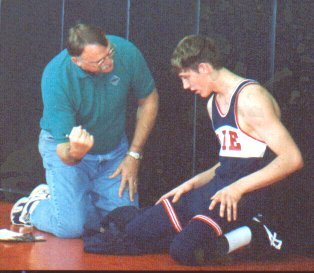 The book includes summaries of state tournament competitions, photographs and tables of repeat champions and collegiate wrestlers. See www.leehighwrestling.org for ordering information. Coach Bofinger makes are few remarks at his induction ceremony. On the left are Stephanie Sara and Jim Ravanack. On the right is Lee Roy Smith, the executive director of the National Wrestling Hall of Fame and Museum. Coach Bofinger is presented his Hall of Fame plaque by former Lee High wrestler Beau McGinnis. 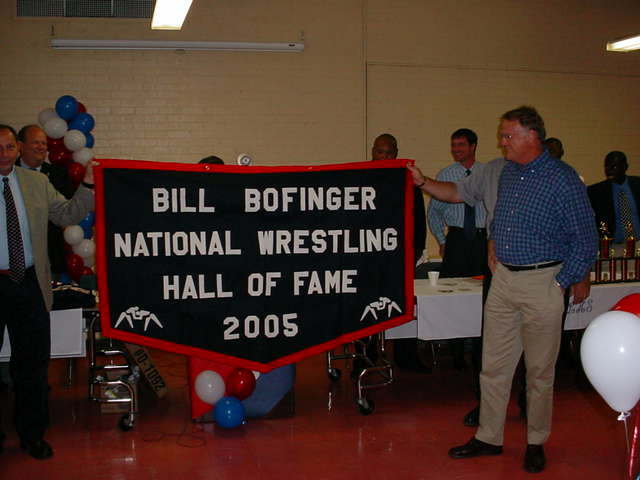 Coach Bofinger flanked by his wife Becky receives his National Wrestling Hall of Fame Jacket from John Smith of the National Wrestling Hall of Fame and the head coach of the 2005 NCAA champion Oklahoma State University (OSU) Cowboys. Coach Bofinger with Lee High wrestlers from 1969-2001. Becky Bofinger, National Wrestling Hall of Fame Coach Bill Bofinger and OSU Coach John Smith. Coach Bofinger is recognized for his National Wrestling Hall of Fame induction at Lee High School.